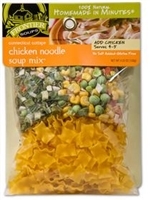 In support of your 5 Day Pouch Test we offer four varieties of the popular Frontier Soup Meal Mixes. Prepared in your kitchen with a few select ingredients you will enjoy a hearty meal in about an hour, a meal that will keep carb cravings away for hours. Put a pot on the stove and let's make soup! In addition the the LivingAfterWLS Bookstore you will find Frontier Soup Mixes at select retailers nation wide.